1 How to cook soup in multivarka? many people know, that the soup tastes better on the second day, when it is better to configure themselves. A distinctive feature of the preparation of borscht in multivarka is, that he is preparing for technology, which it is used not just cooking, and now weariness. This process helps to know the true taste of food, who previously cooked in the oven, where it languishing-infused for a long time. Options for cooking borscht in a great variety of multivarka, consider a few of them. 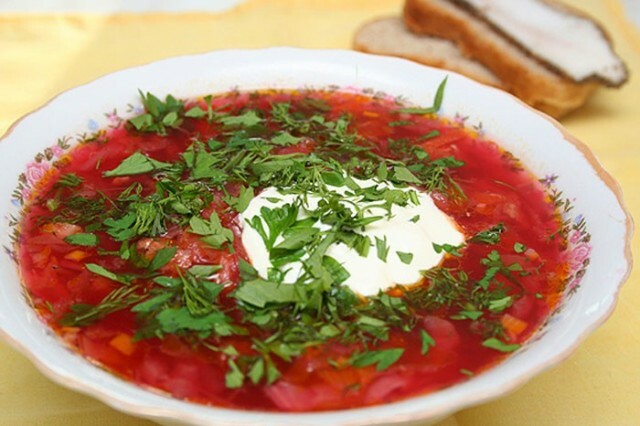 Cossack borsch can be cooked as a vegetable, ie vegetarian, without meat, and meat, or just filled with fat. For a vegetarian option, used to fill not broth, and water, when cooked, you can also add pre-cooked or canned beans. 1,5 L of water or broth, by 1-2 PC. average beet, carrots, bell peppers and onions, small parsley root, celery or parsnip, 3 PC. potatoes, 300 g cabbage, 2-3 tomatoes, 100 g Tomato paste, vegetable oil for frying, 100 g lard salt, 3-4 garlic cloves, Bay leaf, 2-3 ch.l. salt, a little sugar, 1-2 ch.l. citric acid (taste), dill, 200 g of boiled meat broth, sour cream to the table. How to cook borsch Cossack in multivarka? 1. my, Clean and chop the vegetables. Onions cut arbitrarily, carrots and beets three on a coarse grater or cut into small strips. Cabbage julienne shinkuem, Mnemonic little hands. Tomatoes can be rubbed on a grater or chop, parsley root or parsnips cut into fine julienne, bell pepper into small cubes, sliced ​​potatoes. 2. In a bowl, pour vegetable oil and turn the program “Baking/Roasting” 15 minutes. And sequentially laying fry with the lid open bow, carrot, beets, stirring, to not burnt. Then add tomato paste, some water or broth, citric acid, pinch of sugar, bell pepper, and continue to simmer, closing cover. 3. In the bowl lay sliced ​​potatoes, white root, cabbage, tomatoes, fill with water or broth, do not forget about salt, and set the program “Stewing” on 50-60 minutes. for 15 minutes before adding bay leaf lard, minced garlic and herbs, or pounded in a mortar. 4. Serve with greens and sour cream, bad file or dumplings with garlic croutons. meat (beef, fillet) – 200 g, potatoes - 2 PC., carrot - 1-2 PC., beets - 2 PC., bow - 2 PC., tomatoes - 3 PC., sweet pepper - 2 PC., tomato paste - 100 city, cabbage - 300 city, garlic -3-4 cloves, water or broth, salt, pepper, citric acid taste, couple leaves lavrushki, greens and sour cream to the table. How to make soup “lazy” in a slow cooker? 1. My meat and cut into medium-sized, my vegetables and clean, bow, pepper, carrot, cabbage cut into strips not too large, Carrots can be rubbed on the grater, beets cut into halves, potato cubes, garlic, we press. 2. Laying in a bowl all the ingredients sequentially, add a couple tablespoons of vegetable oil, pour hot water or broth, and to the mark put on the mode “Stewing” on 1,5-2 o'clock. Council: Carrots and onions can be pre-fried 10 minutes on the “Baking”. 3. for 10 minutes before the end we obtain a boiled beet and three on a grater, add back to the pan, it will give a nice color borscht. You can add both of the chopped greens, better dill. 4. Serve with sour cream and herbs. 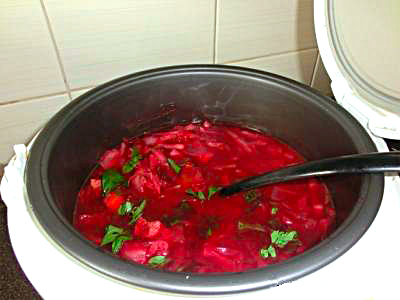 Another recipe for borscht, which is similar to the number of the previous recipe ingredients, but differs slightly in cooking technology. How to cook soup with beef in multivarka? The meat in this recipe is first lightly fried in butter or lard in a mode “Cooking/Baking”, then add to it consistently and fried chopped vegetables (bow, carrot, beet), tomato paste, a little citric acid or vinegar to preserve the color. Then he laid sliced ​​potatoes, tomatoes, Bulgarian pepper and cabbage, the contents is filled with water, added white roots, salt, garlic and spices to taste. Then, all languishing in the regime “Stewing” about 1,5-2 hours for normal Multivarki, and the time will be reduced to Multivarki-cooker to 45 minutes. Served soup with greens and sour cream.